KISS have announced a new series of comics called KISS Kids will begin publishing this fall. The new venture will feature work by KISS series writers Chris Ryall and Tom Waltz with art by Jose Holder (Mars Attacks The Real Ghostbusters). 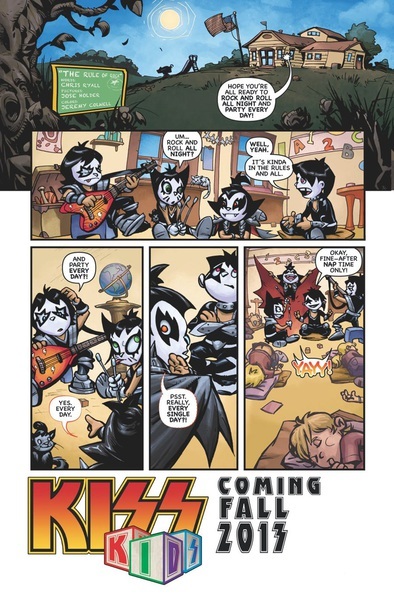 The new KISS Kids series is being previewed in the form of a one-page strip on the back cover of all four issues of this spring’s KISS Solo series. Fans will get their first real look at the KISS Kids on April 10, when KISS Solo #1: The Demon by Ryall and artist Angel Medina is released.